It took little to persuade Jocre Arts to come up with some exclusive patterns for our Pure Silk 20-2 yarn. "Wonderful to knit lace work with". Jocre Arts have been producing fine lace work and lace patterns for a number of years and were delighted to have the opportunity to try our silk. Pictured left is the Ivy Brambles Silk Scarf featuring a vertical lace trellis and Jenns Fern pattern. 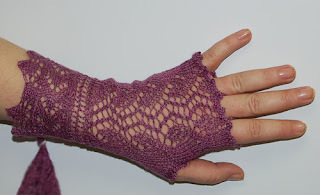 Jocre have produced three fabulous one skein patterns (actually much less for the gloves). One skein will make both the scarf and either one or possibly both pairs of fabulous silk fingerless gloves. 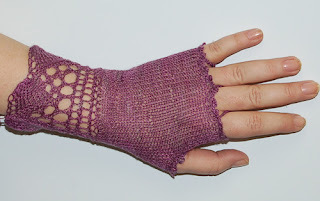 To the left is the Trellis Grapevine pattern fingerless gloves. The last pair of fingerless gloves features a cockleshell pattern. All three patterns are available from your local (or online) Ivy Brambles retailer. We launched our new worsted weight Superwash yarn earlier this year, at a very competitive price, and the patterns have started to follow. 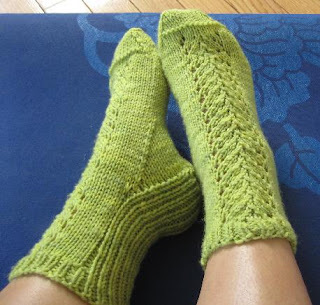 The first new pattern is these fun new socks from Gina House available exclusively from Ivy Brambles. The perfect socks to wear when relaxing after excercise, or any time you need to put your feet up!